This type of dial is known as a navicula dial, because its shape is reminiscent of a boat. It was first mentioned by its Latin name in the 14th century. This example consists of two engraved brass plates back to back, terminating in two protuberances which serve as sights. On one face are the solar and median hours and a zodiac scale. 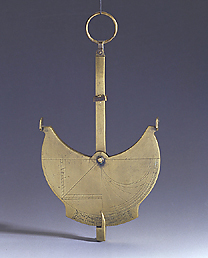 The 'mast' of the instrument, pivoted at the centre, can describe an arc of approximately 45? and its protruding lower extremity can serve as a pointer.